With this AMAZING weather we are having, why not whip up one of these delightful Ice Cream Sundae recipes, there’s something for everyone! Nutty Toffee Banana Sundae:- Slice a banana into a bowl, add two scoops of Vanilla ice-cream then some whipped cream, sprinkle with flaked almonds and cover in toffee sauce. 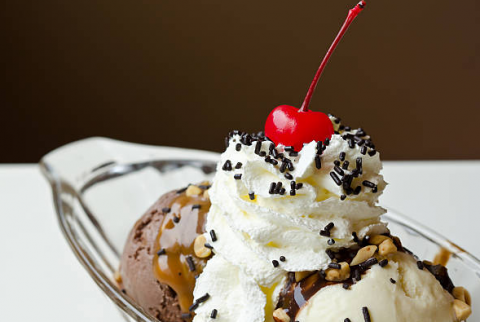 Chocolate Banana Sundae:- Place two bananas in a bowl, add two scoops of Vanilla ice-cream, a whirl of whipped cream, sprinkle with chocolate sprinkles, cover with chocolate sauce and add a cherry on the top. Cool Choccy Mint Sundae:- Add one scoop of Chocolate and one scoop of Mint ice-cream into a bowl, then add a little whipped cream some broken Mint matchmakers and a dash of Creme de Menthe. Chocca Mocha Sundae:- Place a scoop of Chocolate and Coffee Ice cream into a dish, then add a little whipped cream, fudge sauce and a crumbled flake/chocolate chips or chocolate sprinkles to finish it off. Super Strawberry Sundae:- Place 2 Scoops of Vanilla Ice cream into a dish, add sliced strawberries, whipped cream and some strawberry puree (or sauce) and a few broken milky bar buttons, white chocolate chips or some grated white chocolate of your choosing. Create your own indulgent recipes using Liqueurs such as Creme de Bananes (Banana Liqueur) or Creme De Cacao (White Chocolate Liqueur).